To enhance the sustainability of outcomes, CPCS prioritises long-term accompaniment over one-off programmes. Through this approach, CPCS expands safe spaces and creates platforms for dialogue and understanding, which are essential for establishing mutual trust and an environment conducive for transforming conflict. CPCS also builds relationships with key individuals and institutions directly involved in peace processes. These relationships provide a myriad of perspectives on conflict dynamics as well as opportunities to support and strengthen locally led efforts. New projects are frequently identified through feedback from these partners and are designed to fill identified gaps, strengthen conflict transformation approaches, or to bring together key actors to develop new strategies for reducing conflict. CPCS always remains pro-peace in our peace process support work, as well as impartial, flexible and transparent, providing resources as they are required to all parties in the respective processes. 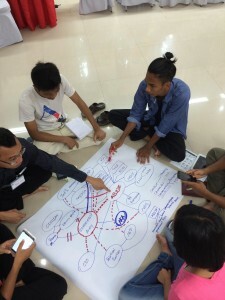 CPCS offers structured conflict transformation courses, such as the unique Applied Conflict Transformation Studies (ACTS) Programme (in partnership with Pannasatra University Cambodia), and conducts workshops and trainings for a wide variety of stakeholders in the region. We consider conducting, documenting and publishing research on emerging issues in peace processes and conflict contexts important elements in promoting Asian approaches to peacebuilding and influencing associated theory, policy and practice. Each year, CPCS therefore produces a range of publications and relevant research on peace talks and the lessons we learn through our involvement. CPCS showcases the outputs of this course, our action research projects and our Master’s programme through online and hard copy publications aimed at strengthening good practice and influencing conflict-related policies and existing peacebuilding models. The findings of practitioners and researchers are further disseminated through our annual regional Peace Practitioners Research Conference, offering a unique platform for critical reflection and the exchange of best practices for peacebuilding in Asia and beyond.